Yarn Type This yarn is spun and dyed in the heart of Yorkshire, the home of Rowan. Valley Tweed is made by using the spinning method traditional for tweed yarns and is therefore very airy and light and has a long meterage. 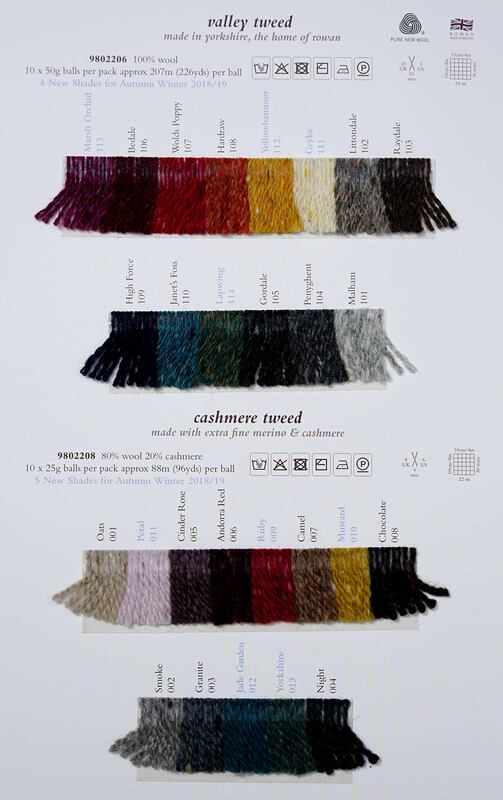 A subtle colour effect is created by using an additional thread of lambswool. 100% wool. Hand wash normal. A collection of 13 designs by Lisa Richardson using tweed yarns and photographed in the Holme valley, the Home of Rowan. This collection of 7 designs for women features simple stocking and garter stitch sweaters, cardigans and accessories knitted in Valley Tweed, a 100% wool yarn made in Yorkshire. The collection was designed by Lisa Richardson.